Governor Rick Snyder signed legislation on Friday to rename a portion of Ford Rd. in the communities of Wayne and Westland the Firefighter Brian Woehlke Memorial Highway. This renaming honors a firefighter who died in the line of duty there in 2013 when a burning building collapsed on him. 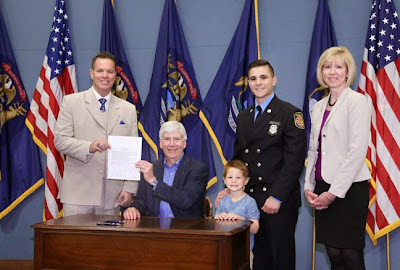 The governor was joined at this signing by State Representatives Robert Kosowski and Julie Plawecki as well as Wayne/Westland firefighter David Polite and his son Tyler. Polite lives in the Warrendale neighborhood.